Kathleen Campbell, professor of music at Seton Hill, conducts the rendition of the alma mater that she arranged at the centennial concert on Sept. 30. Photo by P.Parise/Setonian. In 1919, Seton Hill University conferred its first two degrees, both in music. 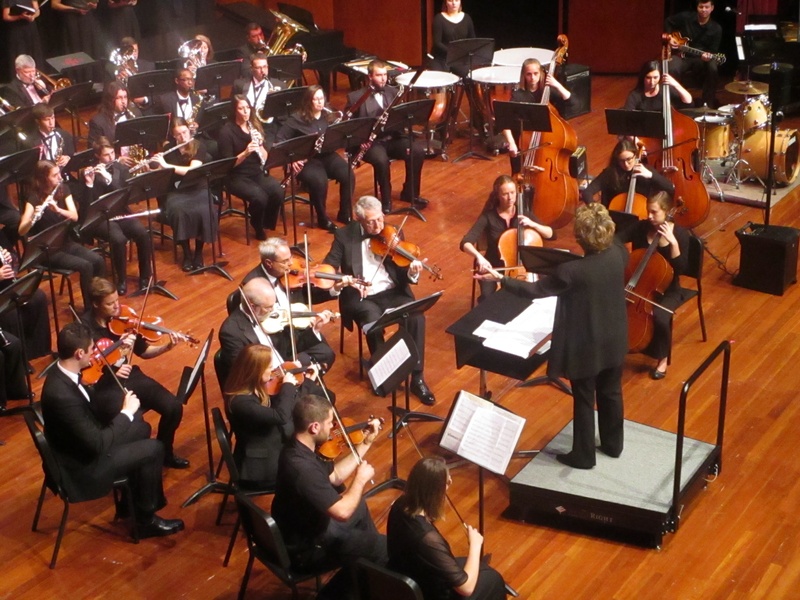 A century later, the university celebrated 100 years of music history with its centennial concert, “Connecting the Generations,” on Sept. 30. The concert honored the Sisters of Charity for their “enduring support of the arts,” and featured music that was composed and arranged by the Sisters of Charity, previous SHU students and current SHU students and faculty. Members of the various ensembles at Seton Hill perform the alma mater at the end of the centennial concert on Sept. 30. Photo by P.Parise/Setonian. 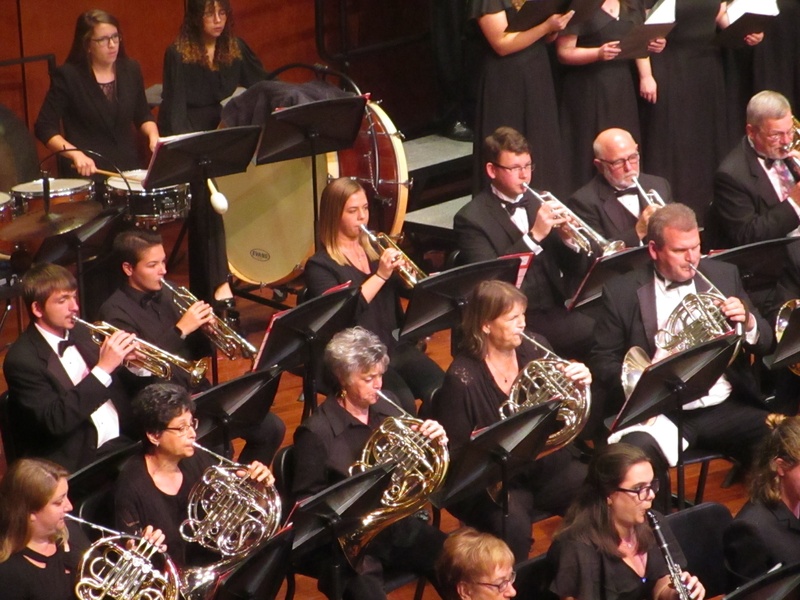 The concert featured performances by the Westmoreland Symphonic Winds, Setonia (women’s chorale), Sinfonia at Seton Hill, Una Voce Chamber Choir, Faculty Jazz Combo and Commercial Music Ensemble, along with a cello solo by community music instructor Sarah Ferrell. Opening remarks were given by Curt Scheib, dean of the school of visual and performing arts; Sister Susan Yochum, provost of SHU; and provincial superior Sister Catherine Meinert of the Sisters of Charity of Seton Hill. All proceeds from the concert went toward the Centennial Campaign for Student Scholarships, which supports music students. Among the arrangements from the Sisters of Charity were “Seton Marche” by Sister Frances Clare Evans (1892-1981) and “What Light is This” by Sister Cecilia Ward (1907-1993), which was featured in the text “Look to the Skies” that was written by Sister Mary Schmidt. Ferrell performed her cello solo to “Monody,” which was composed by SHU student Elyse Jeanne Saraceni while she studied abroad in London with fellow SHU student Beth Ann Johnson. Saraceni and Johnson both lost their lives in the bombing of Pan Am Flight 103 over Lockerbie, Scotland on Dec. 21, 1988 while returning home. 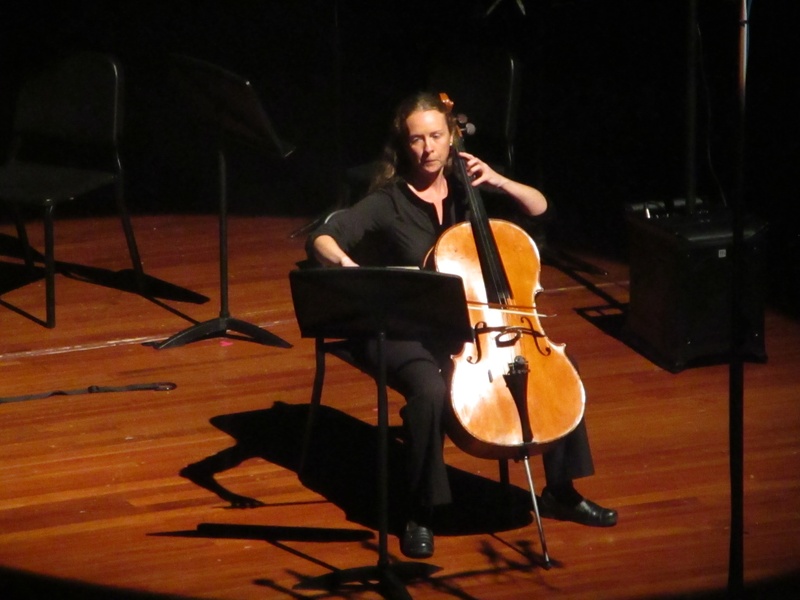 Community music instructor Sarah Ferrell performs her cello solo during the Seton Hill centennial concert on Sept. 30. Photo by P.Parise/Setonian. Maria Long, a junior voice performance and music education major, composed and conducted “Prayer at Sunrise,” a poem by James Weldon Johnson. Long also serves as the assistant conductor of Setonia and said she hopes to send her score to a publisher for consideration within the next few months. The alumni whose arrangements were featured include Jim Colonna (’95), Suzanne Rinas (’94), Luke Mayernik (’06) and Stephen Philip Harvey (’14). 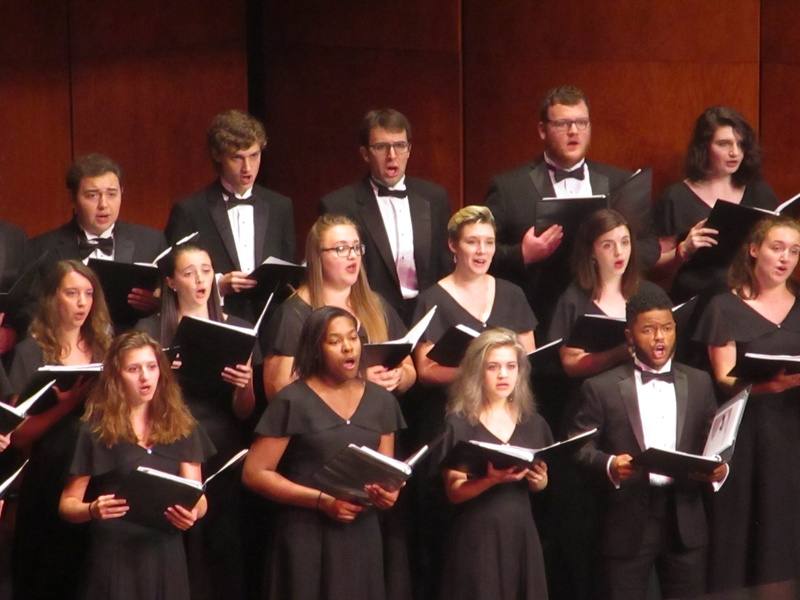 Members of the Una Voce Chamber Choir sing during Seton Hill’s centennial concert on Sept. 30. Photo by P.Parise/Setonian. Mark Boyle, associate professor of music and director of choral activities at SHU, composed “Caritas Christi” in honor of the Sisters of Charity and SHU’s centennial. The concert concluded with a performance of the Seton Hill alma mater that was arranged by Campbell. The concert also featured the Commercial Music Ensemble performing “Beginnings” by Chicago to introduce the new commercial music major that will launch next fall. “When we started to talk about this, it never occurred to me that it was going to align with our 100th anniversary, but what a celebration for us to grant the first two degrees from Seton Hill in 1919 in music, and then 100 years later, be launching a new degree program that I think really reflects the 100 years forward thinking,” Campbell said. The various SHU ensembles will have concerts and recitals throughout November and early December. More information can be found on the Upcoming Events page on SHU’s website.